The garage was a no-go area towards the end of 2008 as painting was in progress. The mood in the garage was poor, mostly as I like to go in there to fiddle with Renaults occasionally but didn't have the opportunity without being poisoned to death. Then at the beginning of this year Robert announced a new job in Spain, so will be unlikely to visit at the weekends from June to fiddle with the Rochdale. One would assume this page will feature a mad rush to complete the car prior to departure. 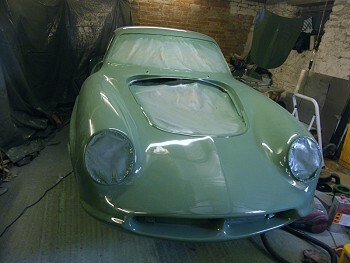 The paint went on quite nicely despite the gloom resulting from covering up the poor lighting with dust sheets. 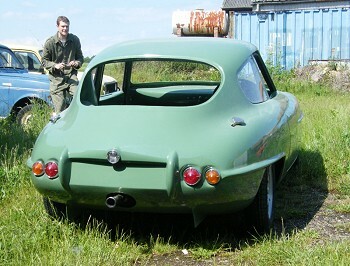 The colour is a Porsche 356 colour - 712 Auratium Green, and is much more pleasing to eye than the previous racing green colour. 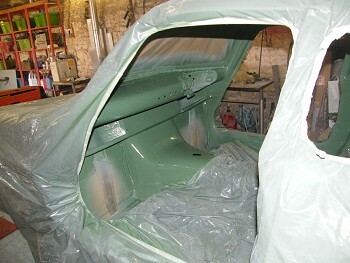 Previously the interior wasn't painted in order to save weight. Robert is getting a bit slack in his old age and decided to add a little paint in here (in places), so the garage was closed for a further weekend. At this point painting was discouraged in the garage, so if you see the car and feel it needed another coat on the dashboard you can blame me. The suspension parts were in for a treat. Shotblasting, followed by 90% zinc primer, followed by an epoxy top coat in light grey. I think there is logic in the light colour rather than black - possibly to to with making things easier to see. But enough of that - the Davrian has gone! I think it's been sold to the parts guy at the Rochdale Owners Club. He can constantly remove the engine in his own garage. The upper wishbones have been redesigned since we last saw them. 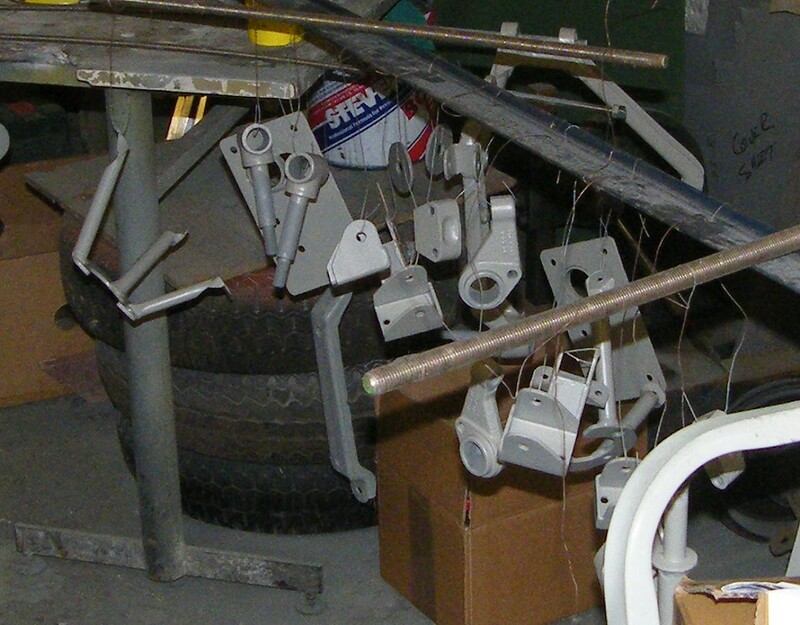 The old ones were flimsy and relied more than they should have on welds. The redesigned ones have been fabricated from 3mm sheet and the structure now relies on folded metal rather than welds. So ribbing someone endlessly can work occasionally. I think the radiator is from an Austin Metro. It's one of many new parts that have been appearing on this project of late. Rear suspension has also appeared. The interesting thing about the Rochdale rear suspension is that it's 3 link plus panhard rod rather than the 4 link you might normally see in this configuration. 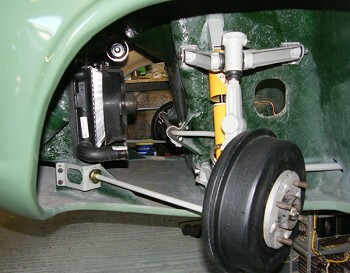 The lower links control the fore-aft position of the rear axle, and the upper links control the pitch. Theoretically a single upper arm is sufficient to control the pitch, but the Rochdale is the only car I can think of where they've been foolhardy enough to put the theory into practice. Bits and pieces have been appearing all over the car. The engine arrived yesterday. It's been down on the south coast being fettled. 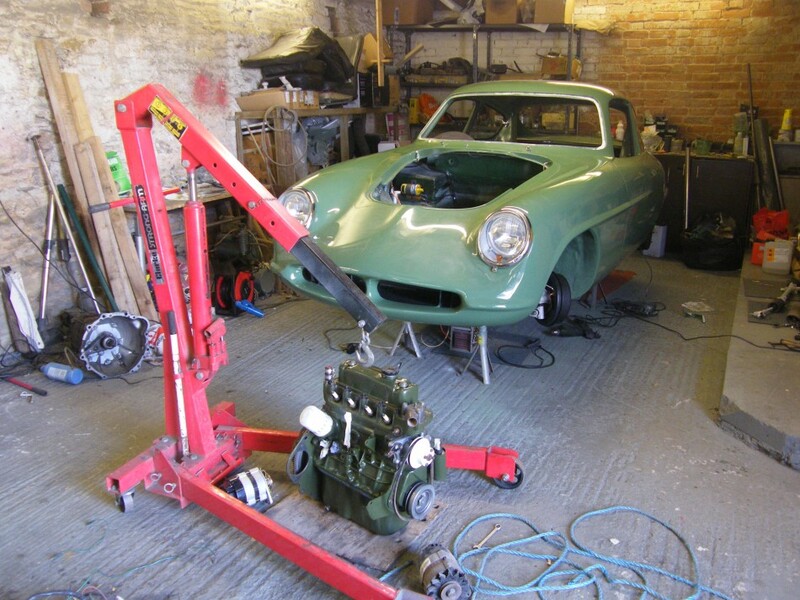 It had been through several head gaskets in the brief period between the original restoration and the crash, and this turned out to be down to Robert's torque wrench being way out of calibration. 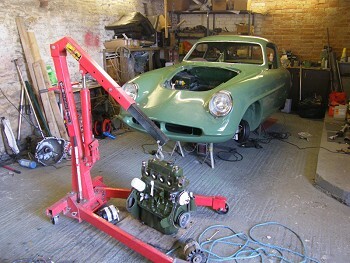 Detailed calibration tests were performed later (involving string and weights) which proved his torque wrench had been reading very low - hence the head gasket failures. And the loose main bearings etc. 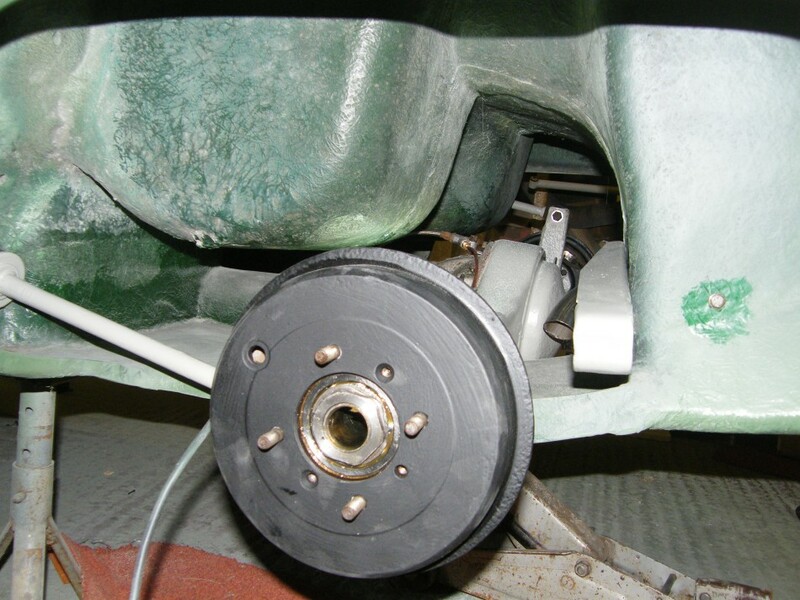 Anyway, having nipped up all the bearings the engine guy also lightened the flywheel. As Robert's move to Spain drew closer his hours in the garage increased. Lately he's been starting at 8am and finish at midnight. Fortunately the rate of progress has not increased, so there's no drop in quality. 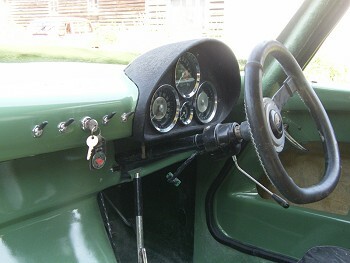 The instruments are original to the car apart from the rev counter. The original Riley 1.5 rev counter was mechanical drive but there's no take off from this engine. The instruments include a vacuum gauge which reads to an ambitious 40 inches Hg. Apparently 12 is achievable. A replacement steering wheel is hiding in the garage. Sensible - I used my good one for fit up and broke it. On the last day before Robert jumped on the aeroplane we bled the brakes and clutch using some very odd purple silicone fluid. The idea behind silicone is that it doesn't absorb water so should be a better bet for storing a car over the 5 year Spanish contract. Then we pushed the car outside for some photos. Funny looking thing isn't it? The exhaust is in place, and the photo doesn't do justice to the tailpipe length - it protrudes a good 8 inches from the rear of the car. 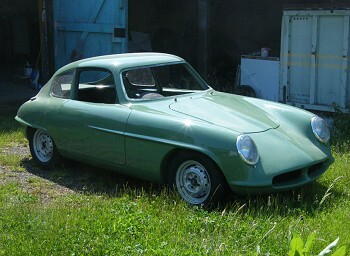 It's a fascinating colour, but one that hasn't been seen on a car since 1955. Green went out of fashion after they mixed it with brown in the '70s, then with silver in the '80s. This one is mixed with blue and white and looks great. 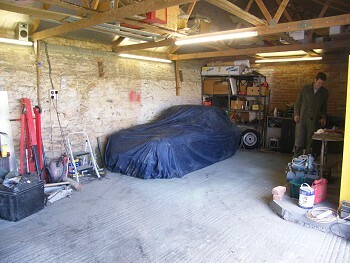 There's been some tidying going on at Robert's end of the garage. Finally the car was packed up in a corner under a cover. It's not been started yet but can't be more than a day off. It needs a bit of glass and interior to finish. It's going to be odd in the garage without Robert in there. That's it for a while. See 2010 for the first big mechanicing holiday.